Special Offer – 50% Off Tattoo Removal! Book a FREE consultatiuon and patch test today, to be carried out any time within the next 30 days, and receive a 50% OFF VOUCHER, if you decide to go ahead with your tattoo removal! 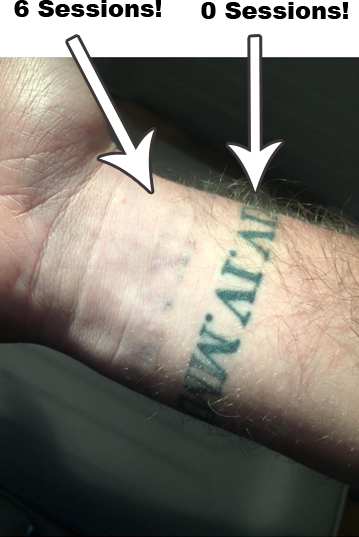 This client wanted a partial removal of his wrist tattoo, and wanted us to remove the bottom band only. You can see how well we are doing after just 6 sessions! Client paying just £40 per session and coming once every 6 – 8 weeks. Prices from just £30 per session – less than 70p per day! Instant quotes via Whatsapp, Email or Phone! Further discounts available for larger or multiple tattoos! Comprehensive pre care and after care instruction given! 5 Star rating on independent website Treatwell! Sessions are quick – on average from just 5-15mins! Pay as you go – you are not tied into paying for a full course!